In summer 2016, Zippy Shell Northern Virginia added a new, even larger shell to its fleet. This new shell is designed to carry our ten and fifteen foot storage units. The newest portable storage shell was manufactured by Wells Cargo and can haul a completely full storage unit with a weight capacity of 5,500 lbs! 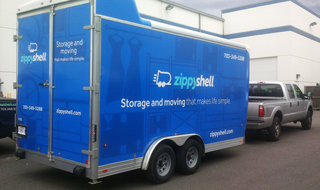 Zippy Shell uses these street-legal portable storage units (sometimes called shells) to transport empty storage containers out to the doorstep of our customers, most of whom are homeowners that are decluttering their home in preparation for sale of the house. We usually park the portable storage units in the client&apos;s driveway and leave them for a few days while the homeowner loads them with their things. It&apos;s imporant to note that even if there’s no driveway parking available, we are legally permitted to park our units on the street in front of the house. This street parking is unique only to Zippy Shell. PODs, 1800-PackRat, and the other storage companies cannot park their mobile storage units on city streets without first obtaining a permit, which can be costly and time consuming. After a few days, we return to the customer&apos;s home, pick up the shell, and transport it back to our public storage facility. The storage container is then taken out of the shell and stored inside our climate controlled storage facility – warm and dry in the winter, cool in the summer. When the customer is ready, we reverse the process and bring the unit back out to their new home. It’s the simplest way to do public storage and moving. Zippy Shell Northern Virginia’s storage and moving business is growing rapidly and we expect that this latest shell is only the beginning of new storage units we will add to our fleet!